The global smoking cessation and nicotine de-addiction products market is growing in patches; however, it is still dominated by developed countries. The analysts at Persistence Market Research have come up with a new publication titled “Smoking Cessation and Nicotine De-addiction Products Market: Global Industry Analysis 2012 – 2016 and Forecast 2017 – 2025.” According to our analysts, growing internet penetration is boosting information dissemination and is expected to largely contribute towards the higher adoption of smoking cessation and nicotine de-addiction products. We have also noticed that North America market is expected to lead in terms of revenue generation for smoking cessation and nicotine de-addiction products during the forecast period. It has been observed that increasing patient awareness, rising disease burden and easy availability of de-addiction products through broad distribution channels are factors likely to impact market revenue growth. Companies in the global market are focusing on internal and external capacity expansion, which ultimately increases contract development and manufacturing activities. NRT product manufacturers are adopting business partnerships, mergers and acquisitions as key development strategies in order to expand their global reach. While analyzing the different segments in the global smoking cessation and nicotine de-addiction products market, our analysts have noticed that electronic cigarette smoking is a growing trend and is expected to largely contribute towards market revenue growth. Online distribution is expected to witness significant CAGR in revenue terms over traditional channels such as hospital pharmacies. While inspecting the global smoking cessation and nicotine de-addiction products market, the negative growth rate for few of the product types has been derived from the sale of respective product/companies in respective regions. Macro-economic indicators such as smoking cessation and nicotine de-addiction products market outlook, active and passive smokers, and others have been considered to arrive at the indicated market numbers. Bottom-up approach has been used to assess market numbers in the global smoking cessation and nicotine de-addiction products market, while the top-down approach has been used to counter-validate the reached market numbers. In order to infer the market size, historical data, primary responses and public domain data has been thoroughly analyzed. Revenue of companies in the global smoking cessation and nicotine de-addiction products market has been benchmarked to ascertain the market size for the base year. Macroeconomic indicators such as GDP and industry growth have been considered to forecast the market size over the forecast period. The historical growth trend of end-use industries, market participants’ performance, as well as the present macro-economic outlook has been taken into consideration for estimating the overall market trend forecast. This data is then validated with the help of the triangulation method and is extensively scrutinized using advanced tools to garner quantitative and qualitative insights into the global smoking cessation and nicotine de-addiction products market. Cigarette smoking is a major cause of lung cancer and other respiratory and cardiac diseases. Awareness about these health hazards has influenced individuals to adopt smoking cessation therapy. Awareness through television advertisements, information brochures, newspapers and other media has proved to be effective in curbing the nicotine addiction crisis to some extent. All these factors are fueling the growth of the nicotine based products segment. The introduction of new products is another factor boosting the nicotine based products segment. Innovative players in the market are focusing on the introduction of novel treatment alternatives such as selective partial agonists of nicotinic receptors (varenicline) and Tabex (Cytisine-plant-based alkyloid). Several clinical trials have been conducted in the specific population, such as pregnant women and adolescents to measure the safety and efficacy of these products. GCC Standardization Organization (GSO) in MEA region has implemented an anti-tobacco law that mandates the placing of warning labels on tobacco products. It includes a picture-based health warning that covers half of a package front and back, with an Arabic warning on the front and an English warning on the back. The Tobacco Control Program at the Ministry of Health and Secretary of the Anti-Tobacco National Committee in tandem with the Ministry of Education and Municipality officials are developing awareness campaigns to warn about the dangers of smoking and banning all stores from selling tobacco products to people below 18 years. As nicotine based products especially nicotine gums are easily available in the market, it will likely drive the overall growth of the nicotine based products segment during the forecast period. China is on the top of the list of countries issuing strict laws and rules against smoking. According to a draft bill, smoking is prohibited in all indoor public places in China – the list includes workplaces as well as public transport. The outdoor restricted areas include areas in direct contact with or in schools, day care centers, historic sites, children's hospitals and stadiums. Such stringent laws are impelling the people in China to shift towards nicotine based products and this is ultimately creating a positive impact on the segment. 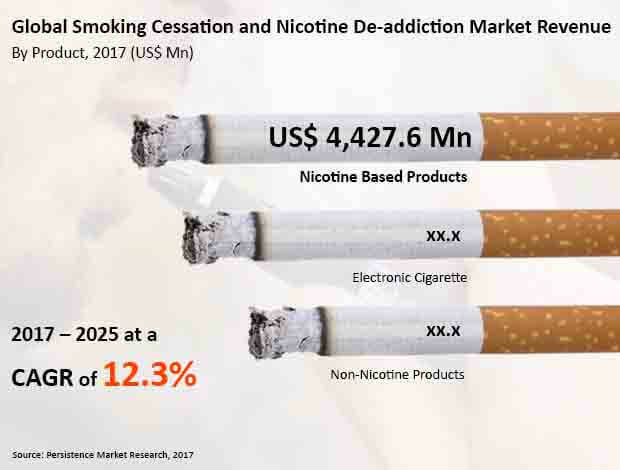 Nicotine based products and e-cigarettes are expected to be the most lucrative among all product type segments in the global smoking cessation and nicotine de-addiction products market, with attractiveness index of 1.4. The non-nicotine based products segment is expected to be the least attractive product type segment with market attractiveness index of 0.1. The nicotine based products segment is dominant in the North America smoking cessation and nicotine de-addiction products market and is expected to be the most lucrative segment. The Latin America nicotine based products market is dominated by U.S. and Europe based manufacturers through distributors. Many of the European companies such as Perrigo Company plc and Fertin Pharm are exporting their products to Latin America in order to expand their geographical reach and gain significant market share. In addition, the availability of OTC products through online channels is helping the European and U.S. based manufacturers to distribute their products easily. The Asia Pacific smoking cessation and nicotine de-addiction products market is experiencing tremendous growth due to growing business expansion of established companies in countries like India and Japan. Moreover, China is a prime manufacturing hub of e-cigarettes and the region is dominated by Chinese players and associated suppliers. The Indian nicotine gum market is highly dominated by companies such as ITC, Cipla Ltd., GlaxoSmithKline plc and Dr. Reddy’s Laboratory (Novartis).